But They Gave It To Me For Free! Hah! 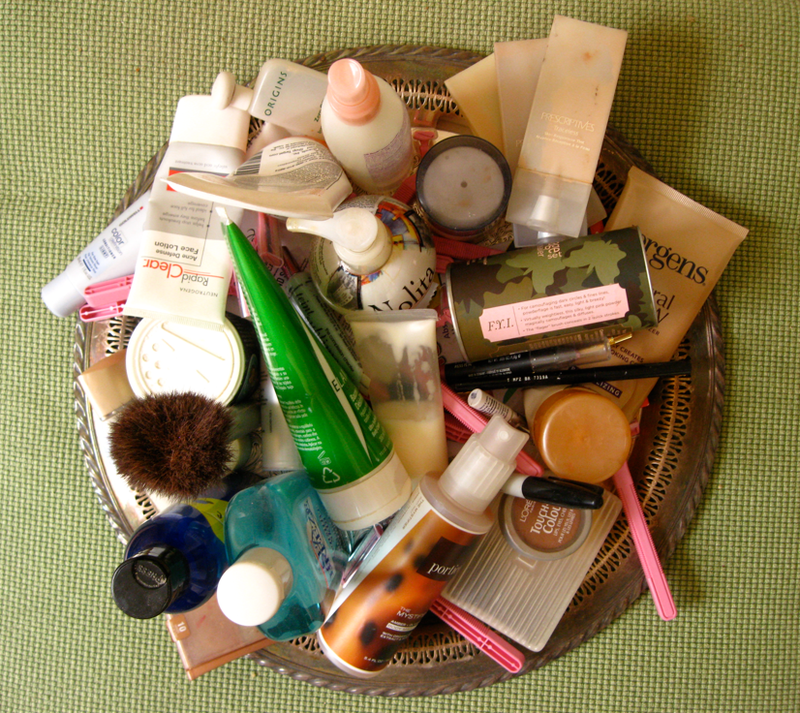 Even I, cosmetics novice that I am, could probably do an equally impressive purge. What motivates us to KEEP this stuff??!?? I agree on the Target brand razors. They are terrible. And painful. She doesn't mention that this one was a stocking stuffer from last year. Scratch that off THIS year's list! Sal, I have no ideal! Sarah B., it was surprising to me--I've happily used plenty of other Target products but those were AWFUL! Moooooommm! (I should've added an asterisk next to that one. Very nice of Santa! But they're a hoax!) In other news, I am officially removing black mascara from my stocking stuffers list, as this recent cleaning showed me I have EIGHT of them. Rather, I have no idea. I also have no ideal, but that's for another discussion. I loved this post. I don't have any unused beauty products, but that's mostly because 1) I move every year and 2) I'm almost compulsive about purging things. I take great pleasure in cleaning out my life--- not only does this busywork keep things tidy, it allows me to procrastinate self-actualization indefinitely! Good job! It is amazing how long we keep things, because we might use them again or because we like the idea of having them around. You are better off without those products! Laughing aloud is not something I usually do in the fairly early morning, but I did when I read this post. (And I smiled again when I recognized my own wrinkle cream that doesn't seem to do "much" - I keep hoping that however small the effect, it's a matter of incremental change that will one day bring back my 21-year-old face.) I recently "inherited" a small, attractive earthenware corked pot containing a mysterious reddish powder, which I stored with my art supplies until I discovered its twin in a store being sold as blusher/rouge, so now I have yet another container in the bathroom. (It's not bad, really - glad I found it). I would also like to say that I enjoy posts like this, and particularly value them after posts like Monday's, which was wonderfully thought provoking and equally enjoyable, in a different way. Ah now if only drugstore aisles were this honest! This is a hilarious post. I've got my share of unused beauty junk hanging out in my bathroom, including an inordinate amount of silver-y eye makeup, which is the only kind of eye makeup I feel comfortable applying (because all you really have to do is smear it on) and way too much fluorescent nail polish. It's like I'm stuck at age 19. P.S. Thanks for the reminders that wrinkle creams don't work. I had a moment of panic the other day when I realized my under eye areas turn into a spiderweb of fine lines and wrinkles whenever I laugh or smile. I had to remind myself that this is perfectly normal for a 32-year-old woman, and that $30 eye cream is not going to do a damn thing. There have been a lot of people that are being more conscious about their appearance, partly because cosmetics What Is Apple Pay? have been making it big in the consumer market. Nowadays most people are considering taking up surgery, it’s good to know whether you need to under the knife or to stick with what you have. I looking around to your wording content its expired me! This was really informative for me thanks for sharing. Click Here For Free Facebook Likes. Most commonly it really is stimulating to learn to read content material from other writers and exercise a specific thing there.